Search for #beanandbear or #beanandbearlake on Instagram and you'll find over 1,100 pictures using one of those tags. A lot of those pictures look the same. Just outside Silver Bay, Minn., the Bean and Bear Lakes Loop is one of the most popular legs of the Superior Hiking Trail. It's also one of the most damaged from heavy usage, earning a spot among the Superior Hiking Trail Association's "Big Bad Five" list of the trail's roughest patches. "I think as the trail has become more popular, and because of that photo opportunity that people are seeking, it's kind of at risk of being loved to death," said Jaron Cramer, the trail association's development and communications director. Outdoors advocates say the way some social media users share their adventures online is hastening the deterioration of scenic spaces around the world. However, the advocates see new social media guidelines issued last month by the Leave No Trace Center For Outdoor Ethics are a step in the right direction. Leave No Trace, a Colorado-based nonprofit, is asking outdoor adventurers to "tag thoughtfully" and refrain from giving away GPS coordinates or detailed information on where a scenic place is located. The idea is that one person's trek to photograph a scenic place begets another, and the cycle continues until a place becomes viral. "It's logical to ask, 'Would this place be as impacted as it is now had it not been for Instagram, Facebook, Twitter, Snapchat or Pinterest?'" Leave No Trace's guidelines say. "Social media, like any tool or technology, can be a force for good or it can have the opposite effect." At spots like Minnesota's Bean and Bear Lakes Loop, it's the latter. Cramer said he hasn't seen any quantitative analysis that proves Instagram and the like are to blame for the trail getting beaten down by humans. But to him, there's little question as to what's bringing people — and their foot traffic and waste — to a few select destinations: "They're doing it for a well-liked post on social media. Not a huge extension to make that assumption." 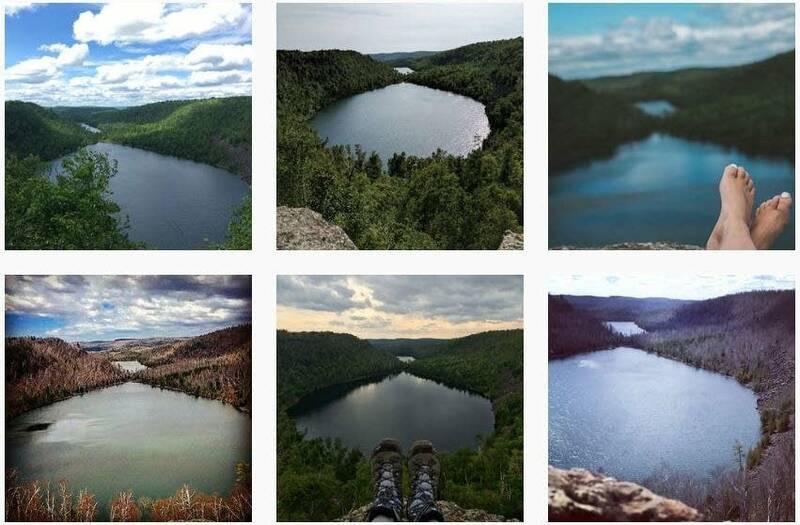 Doug Eischens has been trekking the Superior Hiking Trail longer than Instagram and Facebook have been in existence. The 57-year-old, who's a member of Leave No Trace's Minnesota chapter, said he thinks social media's rise has encouraged more people to explore off-the-beaten-path natural areas than if they hadn't seen the views so easily. "The more you see places, the more you wanna go places, right? I don't think that loving the outdoors to death is anything brand new. We've been doing that for years," he said. "But I think that now it seems a lot more accessible than ever before, those backcountry areas." • "Tag thoughtfully": This means avoid giving specific location information for a picture. • "Be mindful of what your images portray": For example, don't show anything that would encourage poor behavior in the outdoors. • "Give back to places you love": Volunteer for conservation work, Leave No Trace says. • "Encourage and inspire Leave No Trace in social media posts": Consider how a post could be used to educate people about conservation. This, like all the original Leave No Trace principles, aims to be a framework for enjoying the outdoors responsibly, not a hard and fast rule. Cramer and other outdoors advocates want all people to enjoy nature, but to do so responsibly. "We would love to see people enjoying the trail up and down the shore," Cramer said, from the southernmost point near Duluth to the Canadian border. "You know, there's 326-some miles of trail, so when it gets focused in one of those scenic locations, it really does have an impact." And that responsible use of nature must continue to any Instagram post afterward. Cramer doesn't say people should stop posting trip pictures — just make them personal, rather than recreating a postcard. His advice: Don't geotag, don't "check-in" — share a story. "You're sharing a story about your experience outside, which is really what should resonate with folks."